Soap. We all need it - from Alaska to Zimbabwe, Chile to China, soap is one thing all humans use (with a few exceptions). Given its regular use the amount used worldwide must be phenomenal. It's these small items used by a mass population (in soap's case the global population) that could have a significant impact in helping to curb climate change. Sounds a bit way off? Let me explain. Commercial soap - be it the cheap supermarket variety or the luxury, lush scented variety - is often made with petroleum, the non-renewable resource that's being severely condemned for its earth pounding effects when fuelling our trains, planes and automobiles. One soap making company proclaimed that if every household in the US replaced just one bottle of their petroleum based dishwashing liquid with a vegetable based soap, 81,000 barrels of oil would be saved. These mass produced soaps are likely to contain harsh detergents, surfactants, synthetic fragrance and other chemically derived ingredients. Given our skin is believed to absorb 60% of what we put on it these ingredients may indeed wash more than the surface skin and enter the bloodstream. Dry skin, rashes and dermatitis symptoms are not uncommon amongst people using such soap. Many people, certainly the vegans and animal advocates amongst us, who choose to use a natural soap go for a vegetable rather than animal fat based product. Vegetable based soaps retain the glycerin from the vegetable oil used to make them which does not withdraw moisture from the skin like the petroleum based variety. 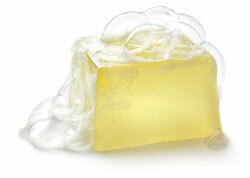 Soap makers who use higher quality, extra virgin or food grade oils are best. The problem with less expensive oil is it's extracted with the chemical hexane, which will find it's way into the final product despite every effort to remove it.